This chicken is very similar to the Dijon Balsamic Chicken that I previously posted, but the addition of a few extra spices make it different enough that I thought it warranted its own post. I love to marinate lean cuts of meat, especially chicken breasts, prior to grilling. It adds so much flavor and helps keep the chicken juicy. This honey balsamic marinade is healthy, easy, delicious, and you probably have all the ingredients on hand! Winner winner chicken dinner! 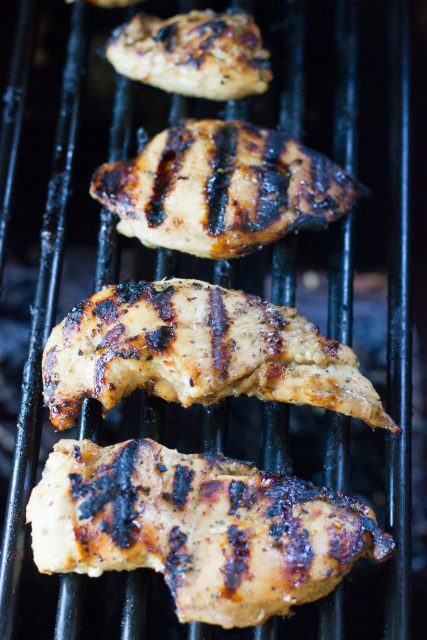 =) Fire up that grill one last time and give this recipe a try. Enjoy! 1. Combine all ingredient except chicken in medium bowl or ziploc bag. Stir until combined. Add chicken and marinate in the fridge for at least 4 hours or overnight. 2. Drain chicken from marinade. Grill on outdoor grill or indoor grill pan until cooked through (internal temp of 165 degrees). Time will depend on size of chicken breasts.